Symphony Center apartments are located in historic Mt. Vernon at the heart of downtown Baltimore’s newest wave of restoration and development. 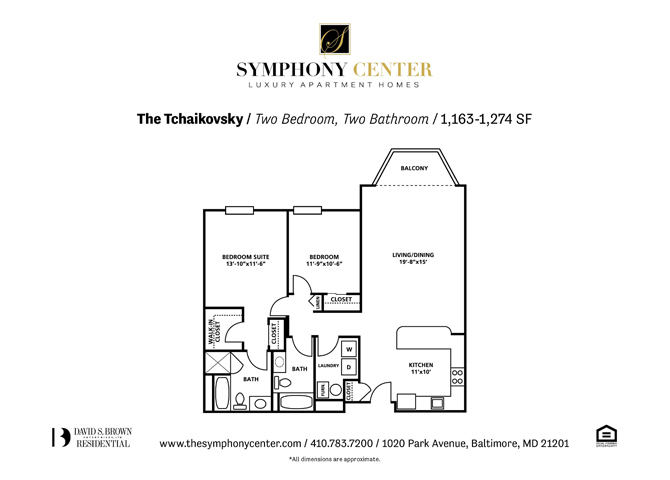 Symphony Center offers luxury 1-bedroom and 2-bedroom apartments surrounded by theater, music, art, and fine dining experiences. Just minutes from the city’s major hospitals and universities, Symphony Center’s residents experience unrivaled convenience. Culture, character, and charm could be right outside your doorstep. Symphony Center apartments offers its residents award-winning customer service and excellent on-site amenities. At the Symphony Center, you’ll enjoy a beautifully landscaped courtyard with cozy outdoor furniture, fireplace, and BBQs, 24-hour front desk service, and the 1020 Club – featuring a game room, kitchen area, and a large media center. But that’s not all, the Symphony Center’s balcony views of beautiful downtown Baltimore are simply breathtaking. Residents of the Symphony Center enjoy proximity to many food and drink hot spots, shopping destinations, and the sights and wonders of downtown Baltimore. Not to mention the city’s major hospitals and universities are just minutes away. At the Symphony Center, culture is right at your doorstep. Is your company a David S. Brown preferred employer? If so, you may qualify for added move-in benefits. University of Maryland, Johns Hopkins University, and University of Baltimore are just some of the employers that qualify. Get familiar with David S. Brown’s Preferred Employer Program by clicking the link below. We’ve lived here for 1 year and so far so good. Really like the central AC, work out area and internet that come with the place. Competitive pricing and we used the student discount bringing the price down a little bit. The parking lot is great, love having a spot ready at all times. Wonderful experience at Symphony Center apartments for the past four years. We truly felt like Symphony Center was our home and we attribute this primarily to the staff. In the seven months that we have lived here, the staff have accommodated our every special request, and made our stay more than worthwhile. The kitchen in our apartment is fantastic and sold us instantly.